How to Use System Image to Restore HP Computer in Windows 10? Using system image to restore HP computer in Windows 10 can save a lot of time for reinstalling system once your HP computer crashed. To create a system image is to make a backup of everything on your computer hard drive or partition. It takes a snapshot of your entire drive, system files and other data. 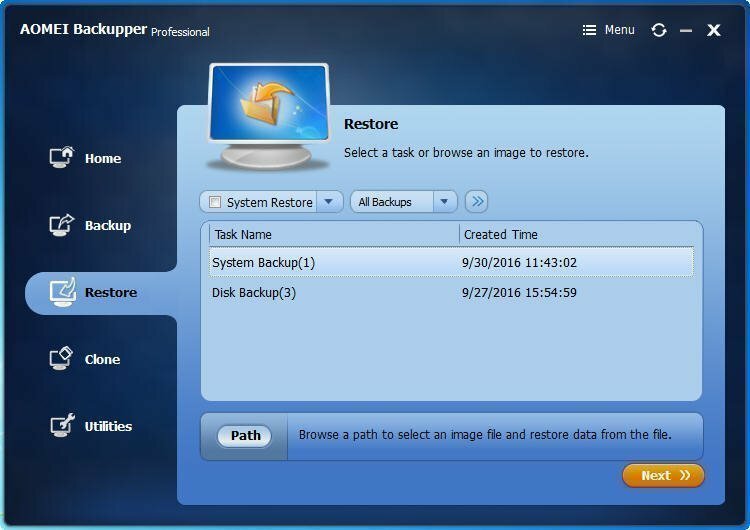 Once your system crashes, or hard drive broken, you can use the system image to restore your computer to an earlier date in a short time. Many HP computer users installed Windows 10 since Windows 10 released. And it is always good to create a system image once you installed a Windows OS on your computer. How to restore HP computer in Windows 10 with system image? Using system image to restore HP computer in Windows 10, AOMEI Backupper should be a goo helper. You can use it to create Windows 10 system image and create system repair disc. It has a fabulous utility Restore which can help you use system image to restore HP computer in Windows 10 with a simple steps.